We are Paul and Sian Lawrance. Paul was born and raised in Northern Ireland. His first experience on the water was when “The Troubles” first started and his father decided that he needed to do something to keep his boys off the streets. So he bought a GP14 sailing dingy and taught them how to sail and race. They progressed to an Islander 24 and then a 36 foot custom built from the Kyles of Scotland, which they sailed off the the North West coast of Ireland. Sian was born in Napier, Hawkes Bay, in New Zealand, but grew up in Wales and the north of England. We met while at college in Manchester, England, and have been married for 38 years. We moved to the States in 1986, but it was not until we moved to Florida in 2000 that we got back into boating. Still working, and with three children, we wanted to be able to get to the Abacos and back during a two week vacation. And be able to take along any friends. So we bought PASSAGE. A Silverton 40 Aft Cabin. We owned her for 15 years and built a lot of memories on her. Click here for the story of PASSAGE. During 2014 – 2015 we decided to plan for retirement. The children had all moved away, so we could now look for the vessel that would become our home-away-from-home, set up for a cruising couple with occasional guests. 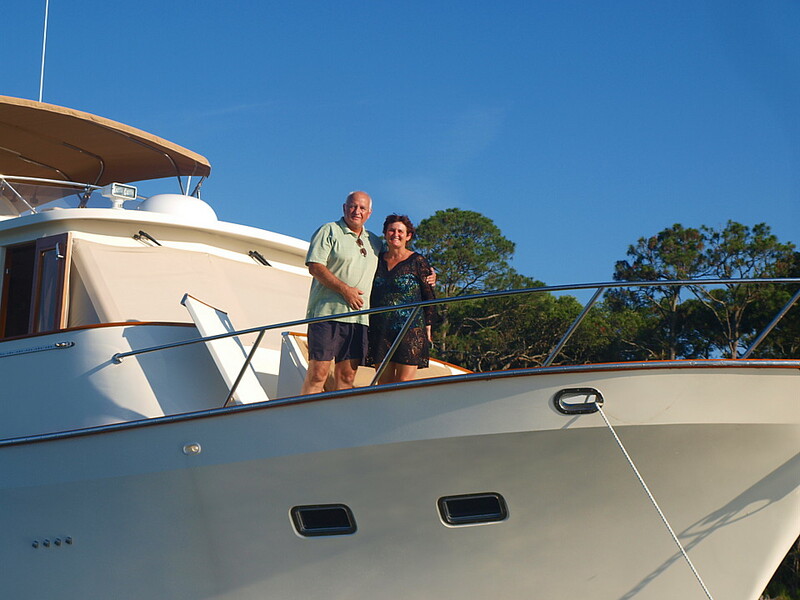 We went to all the boat shows, read all of the literature, and watched Yachtworld.com avidly. After a miss or two we finally found Sonas. The home on the water that we trust to take us where we want to go for the next twenty-plus years! Paul finally retired in December 2016, so now we get to enjoy Sonas to the fullest! Click here to read about SONAS.